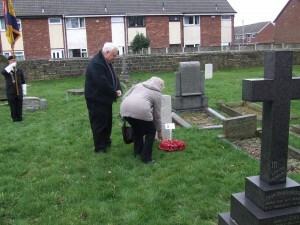 A Walk around East Ardsley churchyard – who did we find? A friend posted a picture on Facebook of the back of a headstone from the village churchyard. 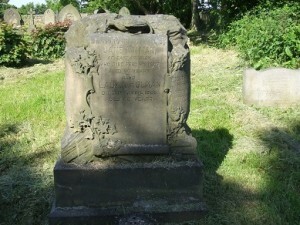 The only part visible in the image was the unusual back, making the headstone quite unique. A walk up to the churchyard on a very nice Thursday morning brought me face to face, well face to stone, with the real thing. 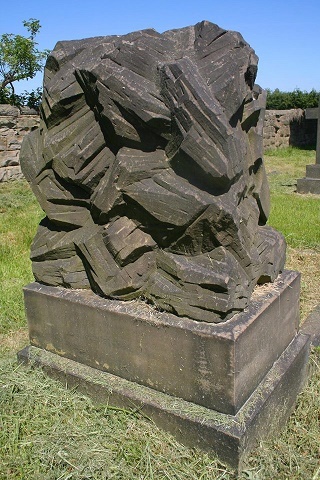 From the back it looks like something you might see on Ilkley Moor – stones piled up in a random fashion. But does the monument mean something more? Who were these people mentioned on this headstone? What connection do they have to East Ardsley? And why does one of the people mentioned have such an unusual name? First mentioned is ‘Jane Holman of East Ardsley, who died Feby 2nd 1907, aged 56 years‘. Jane Holman, was born Jane in 1851, the daughter of William Haley and Hannah Walker. Jane was born in North Brierley, but gave her place of birth as Oakenshaw and in 1881 was living with her family on Green Lane, Cleckheaton, working as a cotton and worsted weaver. 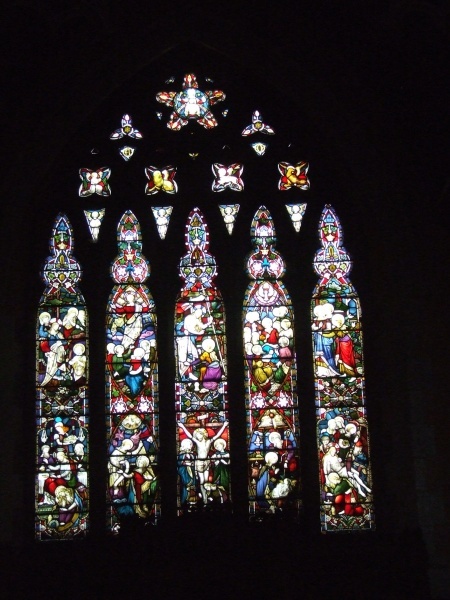 On the 9th of August 1876, Jane Haley went to The Parish Church in Bradford with her family and friends and married Horace Holman, born in Norfolk. Jane was now 24 and gave her residence as Oakenshaw, Low Moor, while Horace was 21 years old, employed as a carrier and also from Oakenshaw, Low Moor. Horace, was the son of Charles Holman (deceased), a cattle dealer. 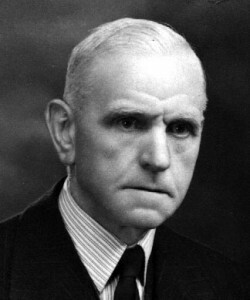 The marriage, after banns, was performed by Henry Prosser, B.A., and both Horace and Jane signed their names, as did their witnesses G J Sewell and Emma Holman – Emma’s signature being quite naive. By 1901 Horace and Jane were established in East Ardsley, living at Allinsons Buildings, with five children living at home. Horace was aged 45, a farmer, working on his ‘own account’ and a carting agent. His sons also worked on the farm. By February, 1907, we know that Jane had died. The inscription following that of Jane says ‘Also, Laban Holman, died 1st April 1966, aged 88 years’. As Laban was Jane’s son quite of a few of the census entries cross. In 1881 Laban was with his family, he was four years old, being born on 2nd of April 1877 at Bottoms, Wyke and baptised on 20th May 1877 at the Wesleyan Methodist, Oakenshaw. 1891, Laban is living and working at Low Street Farm, in the Civil Parish of West Ardsley – he is a farm servant working for William Scott. 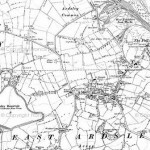 We know from his mother Jane’s entry, that by 1901 the family were living and working in East Ardsley on the family farm and carting business. Within six years of the 1901 census, we know that Jane had died. Her will, proven in Wakefield, left all her business dealings to ‘my son Laban Holman for his own use absolutely in return for the good work he has done for me in managing the business and keeping myself and younger children thereout now for many years.’ Jane also left ‘all those Policies of Insurance on my life in the Prudential Insurance Office together with the household furniture and any money that may be in the house at the time of my death and the residue of my estate to my Trustees upon trust to sell, call in and collect the same and pay my debts, funeral expenses and the costs of proving this my will thereout so doing to pay and divide the same amongst all my children inclusive of the said Laban Holman, share and share alike.’…….what happened to Horace? Probate to Jane, wife of Horace Holman, granted on 21st March to Laban Holman and Charles William Holman, electrical engineer, effect £189 6s. 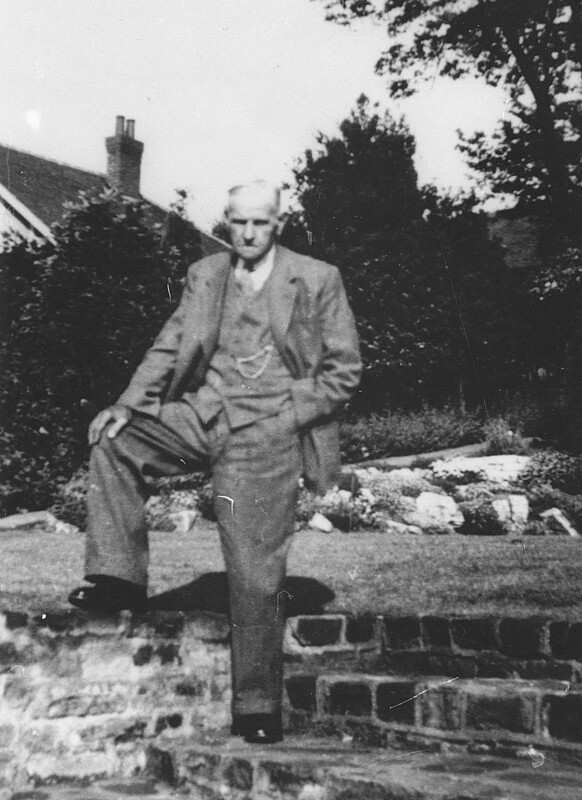 In 1910 there are Tax Valuations showing that Laban had access to various plots of land in East Ardsley and Thorpe – some he rented from the Great Northern Railway, others he owned and sub-let. 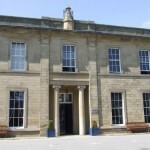 Ten years later, in 1911 Laban is living with his sister Mary, her husband George Harper and their children, at 12 Allinsons Buildings, East Ardsley. Laban is a carting agent, his brother in law, George is employed as a teamster – is he working for Laban? The early 1920’s saw Laban, in directories as a haulage contractor working out of Thorpe with the telephone number of Rothwell 6. 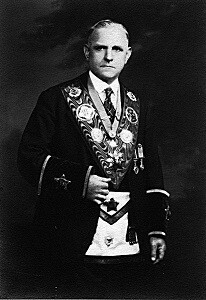 Laban, was also a member of a Masonic Lodge. Laban, as we know, died on 1st April 1966 aged 88. His Probate entry read ‘ Holman Laban of Oaklea, Wetherby Road, Bardsey, Yorkshire died 1 April 1966 at St Helen Hospital, Barnsley, Yorkshire. Probate London 22 August to George Harper, coal and coke merchant and George Stone, bank manager. £4245. 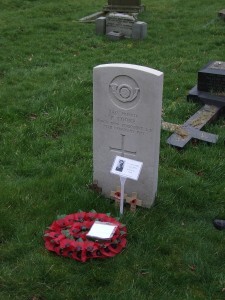 Another section of the memorial mentions ‘Francis Holman who died on 3rd of August 1903, aged 23 years’. Francis is living with his parents at Allinsons Buildings, East Ardsley in 1891 – so the family were in East Ardsley while Laban was living and working on the farm in West Ardsley. Horace gave his occupation as colliery labourer. Francis can also be found on the census as Frank. Also, on a section of the memorial ‘also of Edgar Holman, who died Septr 2nd 1889 aged 1 year ad 8 months , interred at Westfield Chapel, Wyke’. But. what happened to Horace? The 1911 census has an entry for a Horace Holman, carter, living at 19 Queen Square, Leeds, with his wife Clara…..could this be Jane’s Horace, who married Clara Hudson in the September quarter of 1907 in the York Registration District? Could Horace have left the family home after the 1901 census. That could be the reason why Jane left the business to Laban. 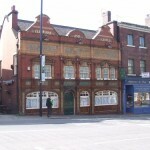 Anyway, there is a death for a Horace Holman in the Leeds area in the June quarter of 1923. The headstone, some say the stonework resembles blocks of coal, or could it be stone. Coal from the local mines or stone from local quarries that the business transported ………..you make your own mind up! Thanks to Alistair Kennedy for allowing me to use his images, he also tells me that other members of the family have interesting stories to tell! 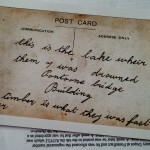 This entry was posted in General, News and tagged 1891, 1901, 1911, Allinsons Buildings, Ancestry, Bardsey, census, East Ardsley, family, Holman, Leeds, memorials, Oakenshaw, Oaklea, photographs, Wakefield, Wills, Wyke, York, yorkshire on June 11, 2015 by carol. A Poacher’s Tale is not always happy one! A few years ago, well it seems like that but is probably longer, I was given a box of photographs to scan and do something with. Some of the carte de visite’s had that were handed to me in a shoebox had names or a clue to who they were. While others, the only clue was the name of the photographer and the place where they had their studio. The box held a wonderful time capsule of images, with many having a Morley, West Yorkshire connection, but others linked by the photographer to places as far away as America and Canada, but that is another tale. One of the pictures was handed over on its own………why? Well, I soon found out. I was asked it I could find out a little more about the person who would be forever the age when the image was taken. 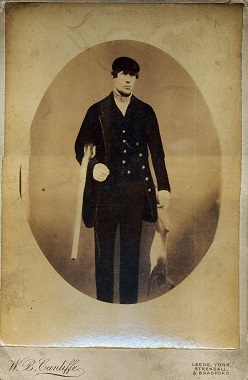 The reverse of the carte gave a name – James Clough, and I was also given a clue that he was a gamekeeper, that would also be suggested by the fact in the photograph he was holding a rabbit and a gun – just a few clues! It was also mentioned that James had been killed, but no idea when – now that would surely give me something to get my teeth into! So, off to find a gamekeeper – James, found in the 1881 census as a gamekeeper. I now had 1819/20 as as approximate time of birth (61 years old), with Morley being given as his place of birth and confirmation of his occupation. He is living with his wife Mary, from West Ardsley, aged 56 and sons George A and Scott, aged 10 and 8, both being born in Soothill. Going back in time to find James as a young man, back to 1851. James was living at Northgate, Dewsbury, working as a blacksmith with Martha, aged 27 from Dewsbury, as his wife – looks like things could get complicated. Martha was Martha Pickles who he married in Dewsbury All Saints in July 1839 after banns were read on the 7th, 14th and 21st of July. Forward in time with a search through newspapers came up with a bit of a surprise! The Lancaster Gazette of 24th of July 1858. The small headline in the newspaper column read ‘Daring Outrage by Poachers’. 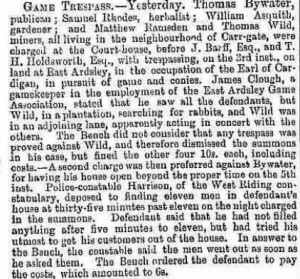 James along with three others appeared before Wakefield Magistrates in July 1858 for night poaching in West Ardsley near Wakefield accompanied by violence. Three gamekeepers were keeping watch on the land owned by Joseph Ellis, esq. The poachers were seen and followed by the gamekeepers and their dog. If you read the article you will see what the reporters said in the paper. But it must have made a stir to be reported in Lancaster. 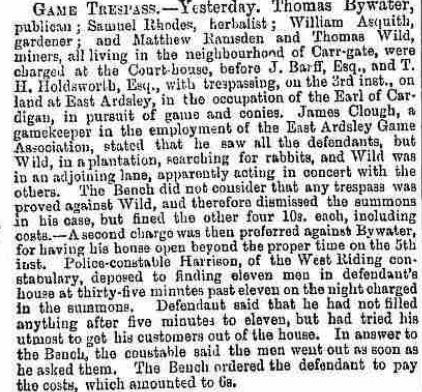 1859, only a year after being accused of poaching, James is now in the papers, and we see the first reference of him being a gamekeeper. A few years late, 1861, James is living as a lodger in the home of Joseph Whittaker – The Joseph Whittaker who he was caught poaching with, in 1858. James is listed as married but his wife is not mentioned. 1871 came around and James is living in Soothill, with Sarah, his wife and son George Albert, aged 4 months. By now James is 51 and Sarah, is 38 – who is Sarah his wife? What happened to Martha? 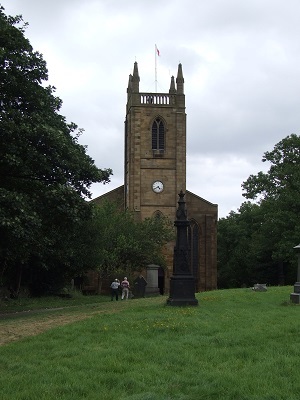 There is a death of Martha Clough in the March Qtr of 1852 and a marriage of a James Clough to Sarah Westmorland on 23rd of July 1866 in Dewsbury Parish Church. James was a widower aged 47 and the son of William Clough, while Sarah was a spinster aged 34, the daughter of Charles Westmorland. 1881 – James is still living in the Soothill area but now quite close to the Babes in the Wood, he is 61 years old. He now tells that he is a gamekeeer and living with his wife – Mary. Who is Mary, you may ask? Well, here we go again. It appears that Sarah died in 1874 as there is a burial entry for her in Hanging Heaton churchyard on 13th of November 1874. The year of 1884 brings another turn-up for the books – James Clough aged 64 married Leah Delbridge, a 53 year old widow, daughter of Thomas Griffiths, on 7th January 1884 again in Dewsbury Parish Church, I hope by now he received a discount! I hope life was going well for the couple who had seen the loss of their spouses, in James’ case he had seen the death of more than one wife. But, life has a habit of throwing things at you. It was in October of 1885 that James Clough, gamekeeper was killed by poachers. 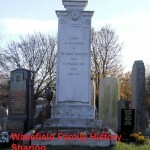 James was laid to rest on the 19th of October 1885 in Hanging Heaton Churchyard. 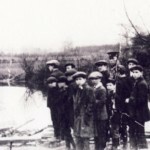 This entry was posted in General, News and tagged 1901, 1911, census, constable, court-house Earl of Cardigan, East Ardsley, East Ardsley Game Association, game keeper, gamekeeper, George Woollen, guilty, History, Isaac Hardwick, James Clough, Joseph ellis, Joseph Field, Joseph Whittaker, Matthew Ramsden, Morley, names, photographs, poacher, rabbits, records, Samuel Rhodes, shot, Soothill, Thomas Bywater, Thomas Thornes, Thomas Wild, transcription, trespass, Wakefield, West Ardsley, West Riding Magistrates, William Asquith, Woodkirk, Woollin, yorkshire on May 31, 2015 by carol. 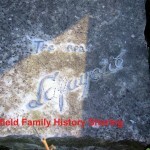 The Great Lafeyette, Sigmund Neuberger, was born in February of 1871 in Munich. When Sigmund was 19 his family emigrated to the United States where he began his career in one of his many guises. Sigmund imitated the career of Ching Ling Foo, who studied Chinese magic and was a very well respected magician in his own country, and developed many illusions, including breathing smoke and fire or producing ribbons and a 15′ long pole from his mouth. It seemed likely that when Ching Ling Foo brought his act to America, a few tried to emulate him, taking similar names and developing similar illusions. 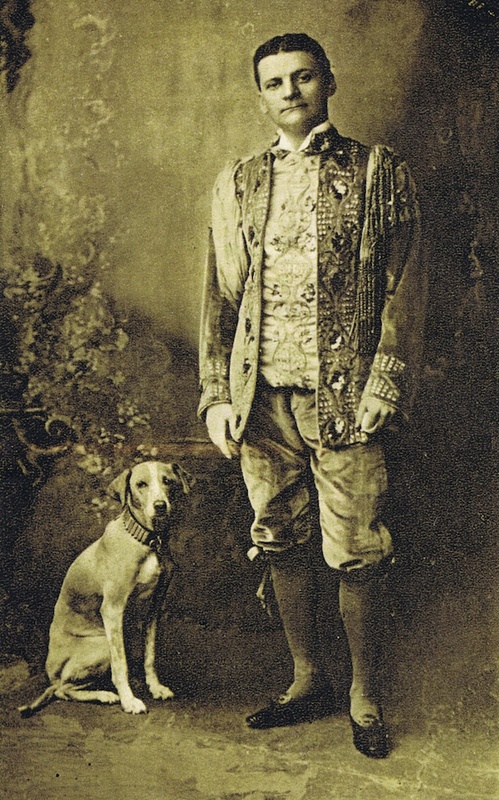 Sigmund, taking the name of The Great Lafeyette, he was famed for his quick-change routines, flamboyant costumes and his dramatic illusions, including one he developed called the ‘Lion’s Bride’ a 25 minute routine – this routine made him very popular with audiences. But he was always aware of publicity and how to draw more people to see his act. He was a world class illusionist and according to many was the highest paid magician of his time. 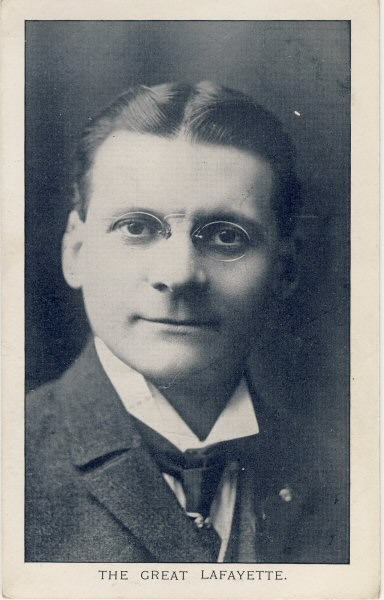 In vaudeville it is estimated that he earned around £44,000 a year, millions of pounds in today’s money. 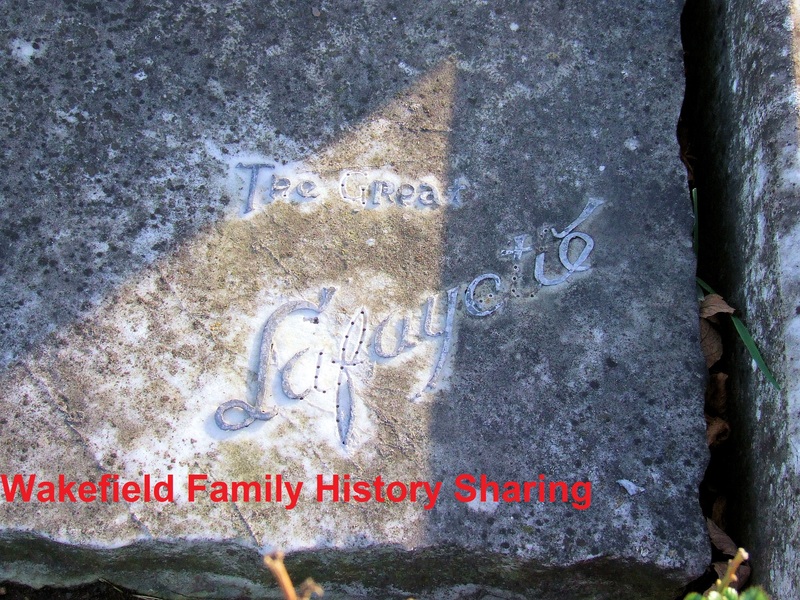 Lafeyette was an admirer of Harry Houdini and the two became great friends. Harry showed his friendship by the gift of a dog, who became known as beauty. Beauty, was pampered even by celebrity pooches today. He had his own set of rooms, ate five course meals and wore diamond studded collars. Both were to become inseparable and life long companions. Life was going well for him, he was involved in all aspects of the shows, including set design, costume design and the creation of illusions. He created shows the like of which had never been seen before. Lafeyette, is reputed to have his own Pullman carriage and he and Beauty always travelled first class, staying in the best hotels and always having a second room or suite for his best friend, Beauty. He also looked after his staff, who toured with him – he paid well, but demanded total loyalty. In 1911 Lafeyette and Beauty were in Edinburgh and set to appear at the Empire Theatre. It was just a few days before the show was set to open that Beauty died. 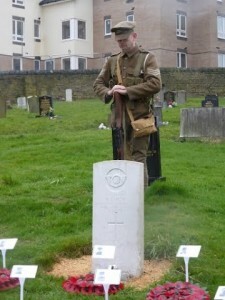 The artist was so distraught that he sought permission to bury his companion in Piershill Cemetery, Edinburgh. The authorities were against this request until Sigmund said that he too would be buried there when his time came. Little did he know! While in a state of deep mourning, it was during his performance on 9th May 1911 that, while performing his ‘Lion’s Bride’ routine an oriental lamp burst into flames. The fire curtain dropped, but not fully. Lafeyette was very secretive of his illusions and had all the doors locked off. The fire very soon became out of control. In less than 20 minutes, the backstage area was ablaze and full of smoke, and the fire curtain fell to the stage. The audience, even in a state of panic all managed to escape to safety, but back stage was a different matter. 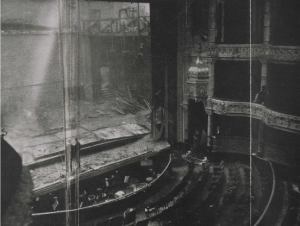 Ten people in the back stage area lost their lives, including Lafeyette. He was identified by his costume and later cremated. But, strangely enough days later, after his solicitor had become involved while trying to find missing ornate jewellery that Lafayette wore, another body was found under the stage, and identified as Lafeyette by a ring. The previously cremated body was that of a man who acted as Lafeyette’s double – a 25 year old man who played in the orchestra. 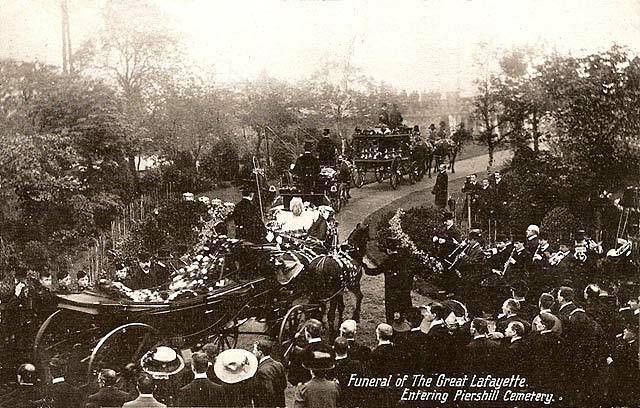 On 14th May 1911, The Great Lafeyette, was cremated and the urn containing his ashes was laid to rest between the paws of his best friend, Beauty. Years ago, while in Edinburgh I visited the grave of Sigmund and Beauty, a quite simple kerbed plot, headed by a simple yet informative headstone. In the company was one James Edwin Baines, who I was sent information many years ago, but with computer glitches lost that information, so I have had to start again. James in 1901 was living on Bradford Road, East Ardsley, a few houses away from the Black Swan Inn, married to Sarah and father to Edwin, Mary, Elizabeth and Esther – working as a Rate Collector. On the night of 2nd/3rd of April 1911 census was taken and there is a James Edwin Baines, born in Leeds around 1861, which ties in with information regarding funeral arrangements made in Edinburgh. James is a 50 year old man, working as a musician, a visitor in the house of Henry Robert Tubbs, a car-porter living in Brighton, also in the house, as visitors, are other acrobats and musicians from various countries in Europe. How has James come from being a rate collector to working as a musician. If James is Brighton, where is his wife. Well Sarah, is within a few miles of her birth – Hanging Heaton. Sarah, in 1911 says she has been married 29 years, bore 11 children and suffered the deaths of 7. But as her husband is not with her, that information has been struck through. 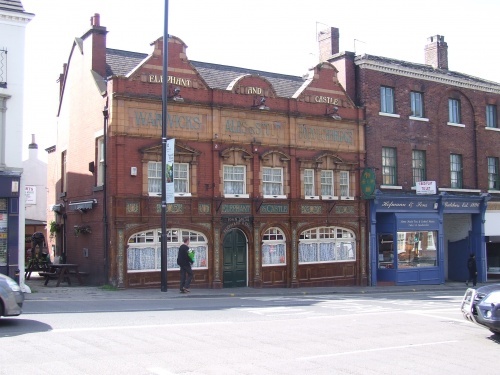 While her husband was away, and more than likely when he was at home, Sarah worked as a woollen weaver in one of the local mills, close to her home at 10 Wordsworth Square, Morley (bottom of Commercial Street). Sigmund is also on the census, he is living at 55 Tavistock Square, London. He is entered as Mr Lafeyette, 38 years old and says he is born in Los Angeles. He is single and works as a Music Hall Artist, of independent means. Also entered is Beauty Lafeyette, aged 16 of independent means and there is a 1 in the ‘children living’ column. Both the children living and the entry have been lined through. In the infirmity section Mr Lafeyette wrote ‘too good’ that has also been struck through. The death of Mr Baines, it is thought was due to a gallant effort to rescue two members of the show from their dressing rooms. The body of James Edwin Baines, of Hackney, London, was encased in a polished oak coffin, accompanied by his wife and sister, he was conveyed by the 10.50pm train to Wakefield, where he would be interred in Woodkirk Churchyard. The solemn event was witness by family, friends and the majority of the local communities, who held James in high regard. On 22nd August 1911, Probate was granted to Sarah with effects if £24 18s – What happened to Sarah and her family. The building that once was the Black Swan Inn, still remains and today 98 Bradford Road, East Ardsley has been the home of H Waterhouse and Sons, since they moved there from Waterhouse Corner, opposite Woodhouse Lane. Note- some sources say that James was accompanied on his last train journey by his brother-in-law. 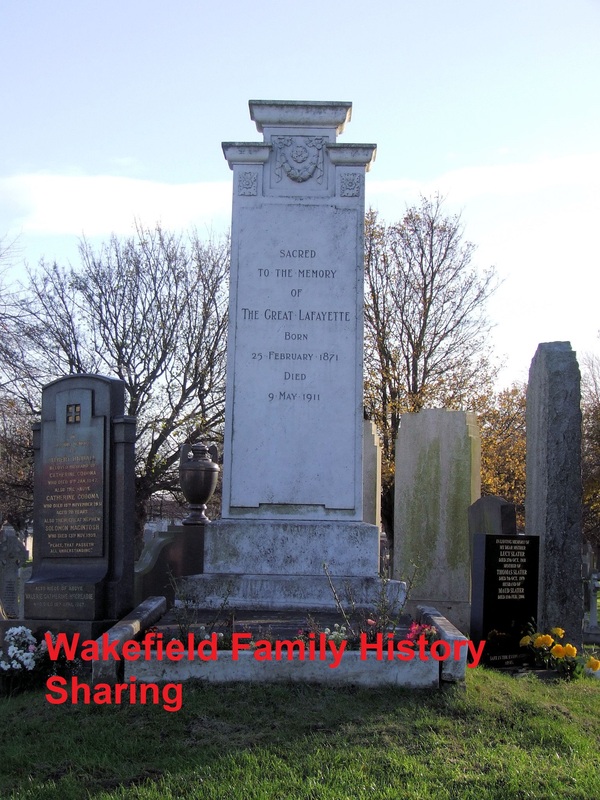 This entry was posted in News and tagged 1901, 1911, cemetery, census, East Ardsley, Edinburgh, Empire Theatre, entertainer, Hanging Heaton, Houdini, illusionist, magician, memorials, Morley, Piershill, records, transcription, Woodkirk, yorkshire on January 31, 2015 by carol. This years Rhubarb Festival will be a 3-day event, running from from Friday 22nd to Sunday 24th February. This year is going to be bigger and better than ever with a market in the Cathedral precinct, cookery demonstrations, walks and tours. Wakefield was traditionally the centre of rhubarb growing with the Rhubarb Triangle covering the Wakefield, East Ardsley, Rothwell, Carlton and Morley areas. For over 150 years the fruit has been growing here, as conditions were ideal. There was plenty of local fuel – coal, and a large number of market gardeners. Years ago rhubarb was sent to Leeds on overnight trains full of rhubarb for the London markets. Along with Champagne, Parma Ham, Yorkshire Rhubarb has protected status and joins British foods such as the Melton Mowbray pork pie, Stilton cheese, Arbroath Smokies and Jersey Royal potatoes to name just a few. p.s. keep the event quiet as I want to be able to get a parking space!! 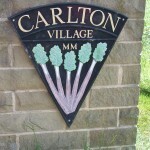 This entry was posted in News and tagged candlelight, Carlton, coal, cookery demonstrations, East Ardsley, event, festival, forcing sheds, History, miners, Morley, Rhubarb, Rothwell, tours, Wakefield, walks, yorkshire on December 30, 2012 by carol. It seems to have been a busy old week, with going to the KOYLI Museum on Tuesday looking for information on a WW1 soldier, work all day on Wednesday and Thursday, now that was very different but very enjoyable. A friend of mine has been expanding his business (SeeYourPast) and I was asked if I would be a guide for a lady from Australia who wished to See Her Past. The lady who I will call B communicated via emails to the SeeYourPast office where she was under the care of James. At the early stages I was not involved, initially knowing only a name, Annie Eccles and an area – not a lot to go on, really! Without a little more information I could be barking up the wrong tree (sorry!! ).But as emails scurried through the air, we found out a bit more and an email giving a link to Prophet Wroe started the ball rolling. As an name and an area was not a lot to base a days tour on. Now I had a bit more information I could look on the census and see where that would lead. I started with the 1901 census as B had said that her husband family had been in Australia around 1905. So, 1901 what did you have to tell us ? Well, Annie was there on the census and the connection to Prophet Wroe was loud and clear. Annie was living in Melbourne House, the Temple based on the design of Melbourne Town Hall and the place where the Messiah could dwell, according to the Christian Isrealites. There were only 2 people recorded as living in Melbourne House, the Head being Mary J Frazer, a widow aged 70, born in Ireland and classed as a General Servant (Domestic). Annie was classed as a neice, single and aged 30, again born in ireland and again a General Servant (Domestic). As I went back to 1891 I found that Mary Frazer had been there as the Head of the House, but there were still only 2 people in a quite large Melbourne House. But Annie in 1891 was described not as a niece but as a Servant. It seems obvious that Mary was basically responsible for keeping the house clean, tidy and ready for visitors, while she and Annie were supposed to keep to the ‘back stairs’. Back a further 10 years to 1881 and I was able to find the parents of Annie (B had not been able to find them). The family consisted of Thomas, a gardener, aged 45 from Co. Tyrone, his wife Elizabeth aged 49 from Armagh and their children, Thomas, a gardener, aged 21 and Annie, a scholar, aged 13 both born in Armagh. There is also a James Eccles, a shoemaker, aged 55 , born in Armagh – all living on Wilson Hill. I now had the information to set out a days excursion for B and myself. B new about the Underwood side so I concentrated on the Eccles who stayed behind in England and their extended lines. Where did we go ? I had arranged to meet B at Westgate Station and from there go for a coffee when I planned to give her an introduction to the places where we were to visit and who was connected to those places. This did not really go to plan. I’d spoken to someone in the The Green Room Cafe, in the Theatre Royal who told me it was open from 8am – brilliant, I thought a place to go for coffee and also include a bit of information about the Theatre. No, what do they say about well laid plans………..as I walked passed from the car park………it was shut !! I was not happy and although Wakefield Westgate Station did a very nice cup of coffee, the atmosphere was not the same. While sat with out coffee I’d shown B some census extracts, Parish Register entries and a family tree I’d compiled for her. Even after a few minutes we had found that we had so much in common. I had been a little unsure while I sat with an A4 sheet of paper with her name in big, bold letters, but that all fell away when we started to chat over coffee. After coffee we started back to the car park and walked as short way up Westgate where I told her about the Elephant and Castle, The Orangery, The Westgate Run and the cattle market, woolstaplers and the large banks. First stop was Wilson Hill. As it happened we parked next to a rhubarb field and it seemed an opportunity to mention The Rhubarb Triangle, B was delighted by the view and the connection to rhubarb as her husbands family had always been rhubarb fans but she had never seen it grown commercially before. Further up the hill and to the left is Melbourne House, as we know the home of Prophet Wroe, later an old folks home and now a part of a telecommunications company. We stopped outside and took piccies, walked down to the farm buildings, the granary and other out buildings now private housing and saw 3 of the 4 gatehouses. Just across the road we paid a flying visit to Carr Gate and the Lawns, then up the road to East Ardsley – Grand View actually. Although Grand View is no longer there you can see the properties next door and across the road. B walked up the road and was in awe of Old Hall which dates back to around 1622. The hall is now divided into 3 dwellings. There were 2 fantastic and very large fire places in the end rooms with a staircase going from one side to the other – linking the two end rooms. There was also a bedroom, panelled in oak(?) and again a large carved fire place. I went in years ago and remember the floors upstairs sloped, making walking across the room a strange experience. While in East Ardsley I took B to see one of the Forcing Sheds and explained the ‘forcing’ process. Our next stop was St Mary Magdalenes Church, Outwood where Thomas jnr (Annie’s brother) married Ada Hemingway. 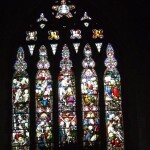 The church was open on Thursday as it was Ascension Day and we were able to walk around at out leisure. 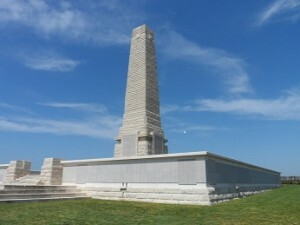 I was on the look out for war memorials and found 2 – the memorial to both wars with names only and a private memorial to the right of the door. Lunch, where to go ? I suggested The Rhubarb Triangle, keeping up the theme, so we headed there. 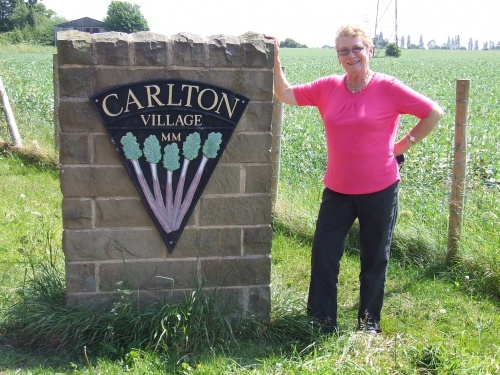 While waiting for lunch B and I chatted about our families and then it was time to head off again, this time to Carlton, Rothwell where some of her family lived and more rhubarb fields. It was here that I confessed to B that I had lied to her during the morning and had a surprise for her but she would have to wait a little. 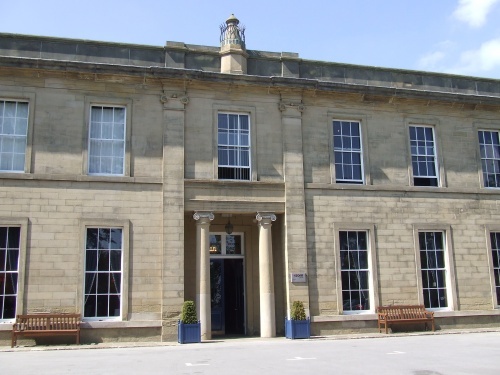 Time was pressing and we headed back through East Ardsley, over the motorway and headed for Wakefield on the ‘old road’ but I turned off towards Brandy Carr and turned into the drive of Melbourne House as I had arranged for B to go inside and see where Annie lived and worked. Even though Melbourne House is a working building and is used every day as a venue for meetings, the building is wonderful. I had seen pictures of the mahogany and ebony staircase and clock and read about the building in a book by Kate Taylor and John Goodchild, but the black and white picture did not do the entrance hall and staircase any favours. I thought the stairs would lead up from the front entrance but I was shocked to see them go at 90º. If we had been able to use the side entrance, now that would have given me the staircase view I had imagined… never mind! The lady who is responsible for the building came to meet us and we told her of Annie and how she was entered in the census of 1891 and 1901 and of Mrs Mary Frazer. We were taken from room to room, up the stairs and passed the clock that is an integral part of the stairs and into more rooms. Back down the stairs we then ventured into the cellar, this would have been very familiar to Mary and Annie. There was a corridor with two rooms remaining, both with vaulted ceilings and mullioned windows, now minus glass, looking onto the hall. One of the rooms still had a large stone slab, which would at one time have kept all the fresh food cool. Back upstairs we went into the visitors room and had a coffee – a wonderful room to the left of the front entrance. Time was now getting on so we said our thanks and goodbyes and after a few photo’s outside the hall we set off to Wakefield and park the car again as B had said she would like to walk up Westgate and see the buildings I’d told her about earlier in the day. It was now nearly time to say goodbye. But I had to make a phone call to James of SeeYourPast as B wanted to thank him for all the help and pointers he had given her over the past few months. Her train was by now pulling into the station, so I said goodbye and wished her a fantastic trip across Europe and said that I would post her all the hard copies of the information. All in all – Hot and sunny day + good company = very good day. I did leave B with one question to solve – Absalom and Annie crossed to Australia in 1905 and crossing with them was a child aged 1 years called Rachael . B had believed her to be the daughter of Absalom and his first wife, but Absalom and Annie had married in the September ¼ of 1904 and arrived in Australia in on 10th April 1905 after a 90 day voyage. So, just who did Rachael belong to? A very big thank you to the staff of Melbourne House – THANK YOU ! For those of you who may link to Annie Eccles and her husband Absalom Underwood here are a few local names that connect :- Bedford ; Cobb ; Hemingway ; Wood and Frost. 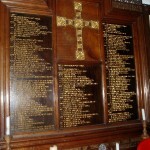 This entry was posted in General, News and tagged 1911, Absalom Underwood, Annie Eccles, Brandy Carr, Carlton, East Ardsley, family, Melbourne House, memory, names, Outwood, Prophet Wroe, Rhubarb, Wakefield, yorkshire on June 5, 2011 by carol.